In Spanish it just means board or council. So I sit on the Junta Escolar Local, but I am not part of the Pilsen Community Academy Junta. – Miguel Salgado was able to find another job in CPS last week. This is no surprise. He’s a great and effective teacher. Our loss is their gain. 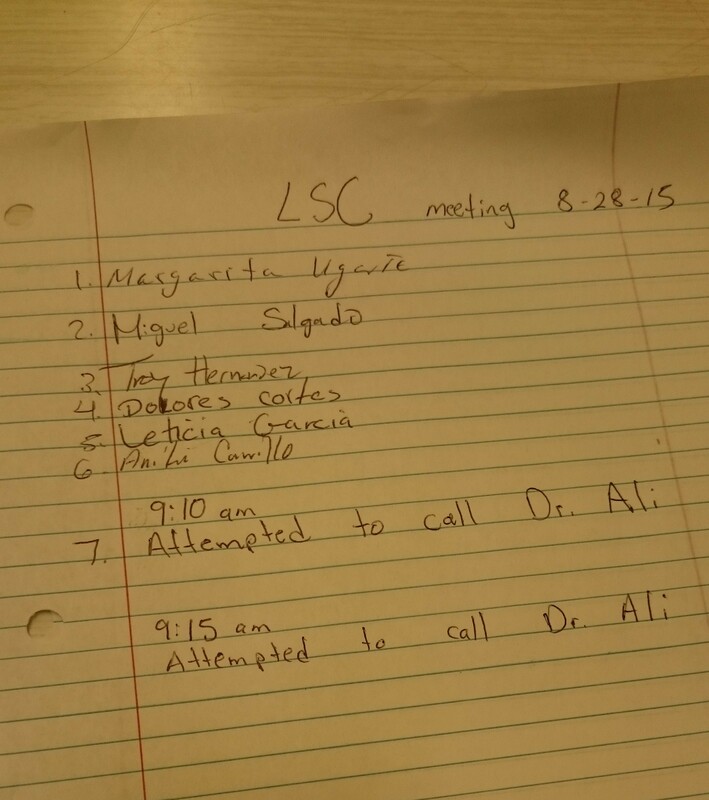 – The principal unilaterally decided to cancel the Friday LSC meeting. He somehow couldn’t make the meeting that we scheduled 6 weeks in advance. He does not have this authority and took this action in open defiance of the LSC. This is insubordination. – The principal’s brazen actions are highly political, especially for an elementary school. Friday’s meeting was Mr. Salgado’s last. Without Mr. Salgado, we have only 6 LSC members. This is not enough for quorum, so the LSC can’t do anything until the teacher’s “elect” new representatives. This includes any of the school’s regular business in addition to voting new parent and community members onto the LSC. So for the time being, Dr. Ali is running the school without LSC oversight. Hence, a one man junta. – The quotes are around elect because the teacher’s votes are only advisory. The Board of Education gets to make the ultimate decision on who serves. – The supporting cast of last week’s post, Vicky Lugo and the Unnamed Gentleman, unkindly asked me to take down the post. They are/were public employees/officials speaking and acting in public and my capacity for the courtesy of not naming this individual is quickly running short. Ultimately, as is the case with many powerful people, the principal’s unethical actions have benefited him in the short term. He’s bought himself some time to gather his allies, as they attempt to stage a coup of the LSC. The trickle of stories from teachers and faculty who’ve been forced out by Dr. Ali’s behavior has turned into a flood since I posted the last story. I’ll be posting some video I took from the meeting last week that speaks to this soon. In the meantime it’s up to the parents, teachers, and community to make sure our public school employees are effective and held accountable for their actions, or lack thereof. Previous Post Retributive Firing at Pilsen Academy?